Nobody understands your special skin care needs better than Dr. Michelle Copeland, preeminent plastic surgeon, biochemist, and author of Change Your Looks, Change Your Life. She has dedicated her entire distinguished career to helping women and men look younger, feel healthier, and live better. Now Dr. Copeland has applied her extensive knowledge of biochemistry to create effective skin care solutions for you, each personally developed from the hundreds of formulas she's evaluated over the years. Since its debut, the Dr. Michelle Copeland range has expanded to include solutions for many common problems of the complexion. Through cutting edge, unique ingredients, the formulas from the brand can finally help you manage virtually any skin care concern from chapped lips to rosacea. The collection even includes safe, effective at-home versions of popular clinical treatments like chemical peels and microdermabrasion. Find the solutions that you've been searching for in the Dr. Michelle Copeland collection. When it comes to healthy, lustrous skin, Dr. Michelle Copeland believes that everyone should have the opportunity to enhance their natural beauty. A flawless complexion need not be the preserve of a few glamorous individuals. All it takes is commitment to a regular skin care regimen and the right products for your skin type. Through her advanced range of skincare products, Dr. Michelle Copeland is fully committed to helping women achieve visible results in their own home. There are no easy fixes. In order to benefit from youthful skin as you age, you must be prepared to invest time and effort in looking after your complexion. However, with a little bit of dedication and Dr. Michelle Copeland's collection of skin care products, it is possible to hold on to younger, more radiant skin. Dr. Michelle Copeland subscribes to the philosophy that looking good can have a positive impact on an individual's emotional and mental wellbeing. By taking a holistic approach to your complexion, you can not only look younger but you can also feel better too. Throughout her career, Dr. Michelle Copeland has never been afraid to be a pioneer. She was the first woman to complete both medical and dental doctorates at Harvard University. She is also the first female plastic surgeon to manufacture her own line of in-home skin care treatments. Whether your skin is sensitive, oily, dry or normal/combination, you can achieve outstanding results when you incorporate Dr. Michelle Copeland's collection of skincare formulations into your daily routine. Many brands claim to be skin care experts, but not all of them have the experience to back up these claims. Dr. Michelle Copeland, a plastic surgeon and biochemist, has created her own line of beauty products using her extensive experience and knowledge. 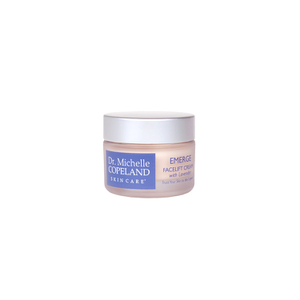 Dr. Michelle Copeland Products include a range of items, from cleansers and exfoliators to self-tanners and concealers. Each of these products focuses on creating healthier, younger-looking skin. Dr. Michelle Copeland Products feature fragrance-free formulas that are not tested on animals, meaning you are applying only the gentlest ingredients to your skin. As a result, you will eliminate any redness or irritation caused by harsh ingredients. Antioxidants, natural ingredients such as aloe, and vitamins are common in Dr. Michelle Copeland Products, giving you healthier, more radiant skin in a natural way. No matter your skin type or skin issues, you can discover a Dr. Michelle Copeland Product that works for your lifestyle. You'll look younger and feel healthier with regular use of this line of products. Turn to an expert when it comes to treating your skin. Years of research and testing went into developing Dr. Michelle Copeland Products, so you know you're using proven, effective formulas. Whether you want to pamper the skin around your eyes or moisturize your skin, there is a Dr. Michelle Copeland Product that is right for you. Gently purify your skin with Dr. Michelle Copeland Daily Cleanser, which includes soothing aloe vera. This soap-free, non-foaming cleanser does not dry out your skin like many foaming, soap-based products. This Daily Cleanser is even gentle enough to use on your eyes to remove makeup. Your skin will feel smooth and refreshed with daily use of this gentle cleanser. Create a healthy environment for your skin by using Dr. Michelle Copeland Daily Normalizing Toner. This non-drying formula is safe for all skin types and is gentle enough to use every day. The Daily Normalizing Toner balances, conditions, and firms your skin while helping to restore its natural acid balance. At the same time, the toner wipes out bacteria from your skin's surface. Simply apply the toner to your face with a cotton ball; you do not have to rinse it off. Enjoy cleaner, healthier skin with regular use. Uncover your healthiest skin with Dr. Michelle Copeland AHA Face Cream. This cream contains 10% alpha hydroxy acid, or glycolic acid, which exfoliates your skin gently. Antioxidants in Vitamins A and E renew your skin; aloe calms it. Kojic acid creates a more even skin tone. The AHA Face Cream can also help to reduce the appearance of fine lines and wrinkles. Apply it daily before you moisturize to slough off dead skin cells, encourage new cell growth, and create radiant, refreshed skin.